Fashioned with Florida styling, this detached 2-car garage plans sports a stucco façade and gentle arches allowing it to blend well with many Sunbelt homes. Two garage bays nicely accommodate a pair of automobiles or maybe a single car and a golf cart. You will appreciate the side-entry service door and convenient, dual overhead garage doors. At the back of the floor plan, two storage closets work well for storing lawn and garden equipment, tools, sporting gear or outdoor toys. This additional storage space provides an extra element of practicality and function not found with most standard detached garage plans. If you are looking for a 2-car garage plan that does more than protect the family cars, consider a garage plan with storage such as this charming design. 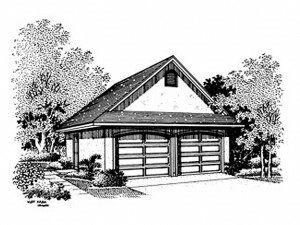 View The Garage Plan Shop’s complete collection of garage plans with storage.